Hyacinth vases are designed to carry a hyacinth bulb in the upper part of the vase, usually called the cup. The lower part has the function of water reservoir in which the roots can grow. 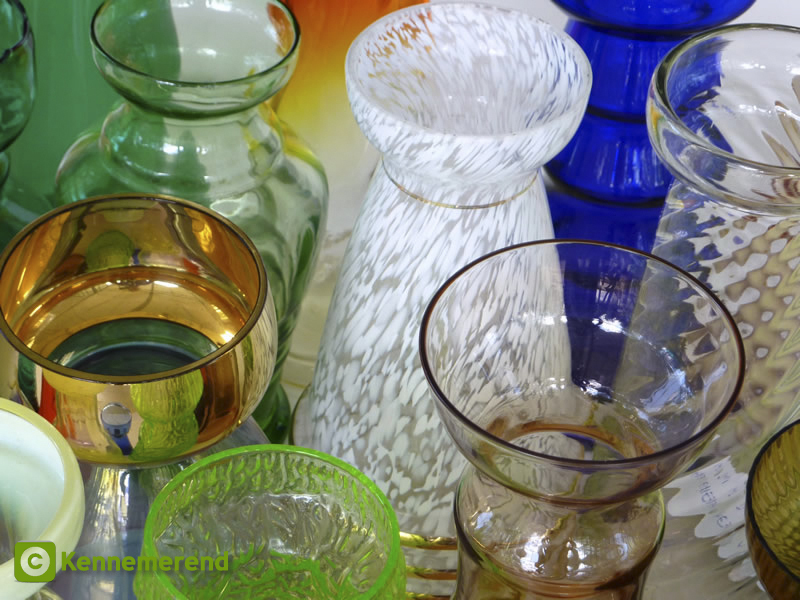 Since the start of forcing of hyacinths on glass with water, around 1730 or even earlier, thousands of different types of glasses have been developed, reflecting changing artistic styles, and including unique, hand painted vases as well as simple manufactured ones, produced by the million. The cup should fit the hyacinth and give maximum support. This is not always easy and it often happens that big plants fall over. In Britain and Germany there are examples of vases that are designed in such a way that an iron support can be placed around or inside the special rim of the vase and hold the plant. Usually old hyacinth vases have a shorter rim than newer vases. Different types of cups to hold the hyacinth bulb. From left to right: a Danish vase, an unknown vase, a free blown British vase, A Dutch ( model Norma, design Rozendaal, Maastricht) and an unknown vase. The neck is the part between the cup and the reservoir, preventing the bulb from falling into the vase. It should therefore not be too large. In 2001, together with my fellow-collector Frans Roozen it was possible to analyse the measurements of many hyacinth vases. Usually an inside neck diameter of 3.0 to 4.0 cm (1.2 to 1.6 in) is normal, with a minimum diameter of 2.5 cm (1.0 in) for the smaller bulbs to a maximum of 4.5 cm (1.8 in) for the largest bulbs. Among collectors of hyacinth vases, often the question arises whether a certain vase is a real hyacinth vase or 'just' a flower vase. As for the neck, diameters smaller than 2.0 and bigger than 5.0 cms (0.8 to 2.0 in) are generally not considered to be hyacinth vases. The reservoir part should be big enough to give room to the roots and supply enough water. A large, low situated reservoir makes the vase steadier. The water contains the necessary oxygen for the roots. Too many roots and little water will sooner give bacterial and fungal diseases a chance to cause rotting of the roots. The reservoir for a larger size hyacinth bulb should contain 400 to 500 cc ( 0,4 to 0,5 litre, ca. ¾ pint) water, depending on the size of the bulb. Stability is important. From left to right, the vases become less stable. 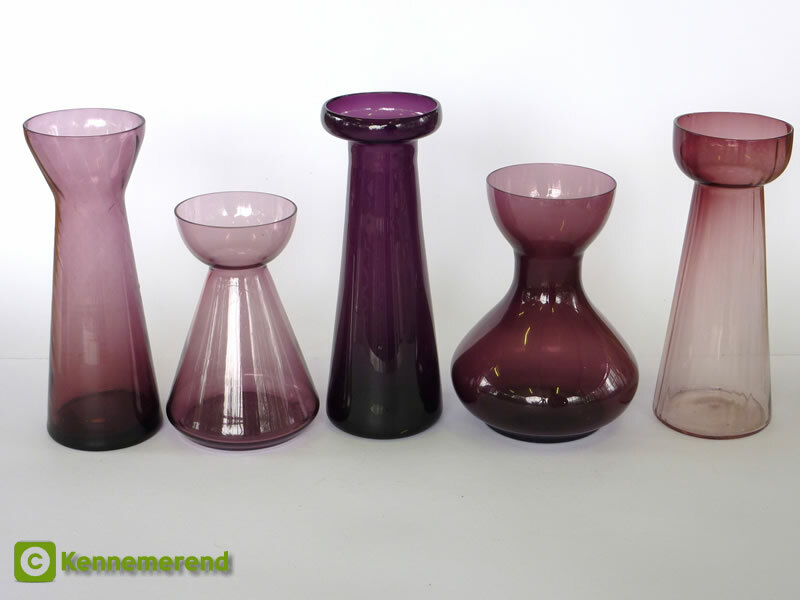 From left to right: Model Belle ( Rimac, Holland), model 583 ( Leerdam, Holland), a free blown American vase, a free blown British vase, an unknown vase. For a good vase it is very important that the vase has a high stability and that it will not tip over easily as the hyacinth plant is developing to its maximum height and weight. An important part is the foot. This is the bottom part of the vase on which it rests. Tall vases with a relatively small foot will tip over easily, not seldom heavily damaging the plant and causing the vase to break. 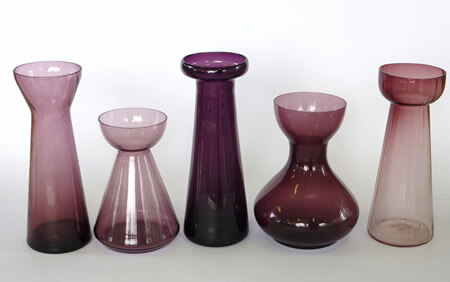 Short vases with a broad foot like the model Belle by Rimac (above) are in this respect perfect: the vase will never fall over. 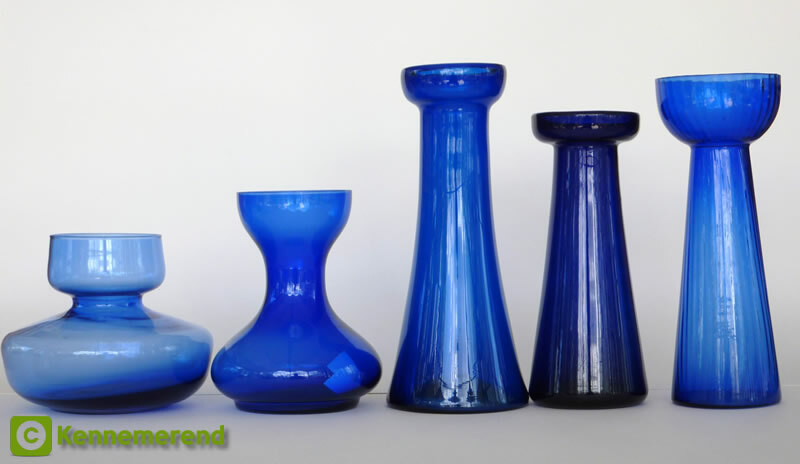 The foot should preferably have a minimum diameter of 5.5 cm (2.2 in) for the shorter vases to a minimum of 8.0 cm (3.2 in) for the taller vases. The height of hyacinth vases is usually not more than 22.0 cms (8.5 in) and not less than 12.0 cms (4¾ in). Taller vases are less stable or are so big that they are in disharmony with the size of the forced hyacinths.